US intelligence agencies had numerous advance warnings about the activities of the Islamic fundamentalist group that carried out the terrorist attack in Mumbai, India in December 2008, according to lengthy reports in the American press Sunday. An American informant had a high-level role in the preparation of the assault, in which 166 people were killed by bullets and grenades. Both the Washington Post and the New York Times carried detailed accounts, in what appears to be, at least in part, an exercise in damage control by US national security agencies, which made several top officials available for anonymous interviews. The newspapers also interviewed two former wives of David C. Headley, a Pakistani-American who has pleaded guilty to numerous terrorism charges and is now in custody and cooperating with the US government. The reports give a glimpse of the murky world in which US and Pakistani intelligence agencies intersect with terrorist groups, some of them affiliated with Al Qaeda. As in the case of the 9/11 terrorist attacks, the US agencies seem to have looked the other way as the terrorist atrocity in Mumbai was organized, or else directly encouraged and facilitated it. Headley, son of a Pakistani diplomat and an American woman from Philadelphia, was born in the United States and has US citizenship. He was born Daood Gilani, but legally changed his name in 2006 to a combination of his Anglicized first name and his mother’s maiden name, apparently because as David Headley he could more easily travel to the United States and India. His role inside the Islamic militant organization Lashkar-i-Taiba included repeated trips to Mumbai to scout locations for the coming attack, as well as purchasing equipment such as night-vision goggles. The account prepared by the ProPublica news service and published in theWashington Post, and a long follow-up article in the Times adding many more details, give a picture of a man whose relationship to the US intelligence apparatus has extended over nearly a quarter of a century. Both newspapers quoted unnamed officials saying that the DEA had dropped Headley as an informant before his active role in Pakistani-based terrorism, statements which appear to be official disinformation to distance the US government from the Mumbai attack. The Times does not question this inherently incredible time sequence. It would have its readers believe that in the last few months of 2001, in the immediate aftermath of the 9/11 attacks, a US intelligence agency simply dropped a longstanding Pakistani-American informant who is fluent in the language of the country to which Osama bin Laden had just fled. Far more likely is that the DEA “dropped” Headley by handing him over to a more powerful agency like the CIA, which would have regarded as invaluable his mixed heritage, language skills and Pakistani contacts—to say nothing of his criminality. Headley’s American wife went to the FBI-led Joint Terrorism Task Force in New York City in August 2005, following a domestic dispute involving her discovery that he was also married in Pakistan. She reported her husband’s role in Lashkar-i-Taiba, adding that he had bragged of working as a paid US government informant while he attended terrorist training camps in Pakistan. The FBI agents who interviewed her on three occasions took no action. Headley was arrested by New York City police for misdemeanor assault on his wife, released on bond, and never prosecuted. This picture of a police apparatus with a phobic aversion to violating the constitutional rights of American citizens, particularly those of Arab-American or Pakistani-American descent, would be farcical if it were not so obviously a cover-up. Clearly there was no investigation into Headley because the agencies involved knew very well who he was, since he was on their payroll. The timing makes the FBI disinterest even less capable of an innocent explanation. Headley’s wife turned him in as a terrorism suspect only one month after suicide bombers trained in Pakistan blew themselves up on London subways and buses on July 7, 2005, killing 51 people. Adherents and trainees of Lashkar-i-Taiba had also been arrested and sent to prison for life in a case in Virginia. 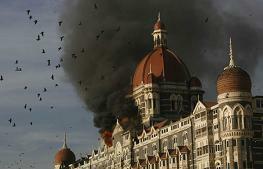 The Taj Mahal Hotel was one of the main targets of the December 2008 attack, with dozens of people slaughtered in its lobby or in their rooms by two gunmen, part of a ten-man team that landed in Mumbai from a small boat. For the New York Times, of course, this account of deliberate stonewalling by the US government represents at most “another communications breakdown in the fight against terrorism.” The US “newspaper of record” cannot say what is: as with 9/11, the evidence suggests not just incompetence or poor organization, but direct complicity between the US government and the perpetrators of a major terrorist attack. The Indian government, which was given access to Headley after his arrest in 2009, is apparently not satisfied with the claims that the American embassy in Islamabad failed to respond because it was overwhelmed with tips about terrorists, most of them bogus. Indian newspapers report that the issue will be raised in talks with US officials during President Obama’s visit to New Delhi next month.